Always be prepared for a medical emergency with a camping first aid kit list when you are camping and adventuring in the great outdoors. You never know what might happen from one minute to the next. Use a first aid kit list to help you better prepare for your next camping trip. Make sure that you know how to use your first-aid kit contents. During an emergency you won’t have time to study the instruction manual! If you spend a lot of time out of doors, you may be wise to take a wilderness first-aid course. You'll never regret it in an emergency situation. So, find out if there is one available in your area. 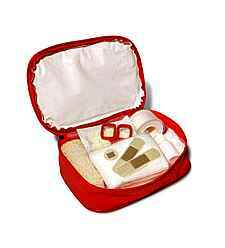 There is a wide variety of first-aid kits and contents available for different outdoor activities. And they come in a wide range of prices. There are kits designed for family camping trips, day hikes, backpacking treks, canoeing, etc. Listed here are some items you should consider when you are compiling your camping first aid kit contents. Please let me know if anything important that's been missed. Also don't forget if a member of your camping group is allergic to something, such as bee stings, then make sure to bring any medication they may need in an emergency.